The LeConte-Woodmanston Plantation and Botanical Garden National Historic Site is open daily to the public for hiking, picnicking and self-guided garden tours. Guided tours are available by appointment only. No motorized vehicles are allowed on trails. The gates are intended to protect this historic site with its fragile system of earthen dikes by excluding vehicles. Pedestrians are invited to explore. Enjoy a stroll through the formal gardens or a hike along the trails and into the swamp. 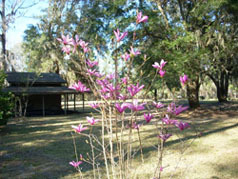 Restroom facilities and picnic areas are always open to the public and are handicapped accessible. Check this page frequently for current site conditions or go to the Plan Your Visit page. For more information or to schedule a tour please contact us . Only with your support, will we be able to continue our restoration and preservation efforts. Plans are underway to erect a deer fence at Woodmanston and a pedestrian gate at the Avenue of Oaks entrance. 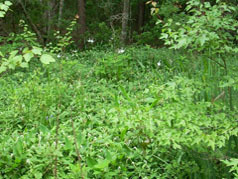 Funds from the Liberty County grant will be used for the project as well as funds from other recently received grants. In March 2014 the Southern Garden Historic Society held its annual conference in the Savannah area. Members of the society visited LeConte-Woodmanston as part of their "Day on Rice Plantations". Read more about the Southern Garden History Society. The McIntosh County Shouters entertained with traditional Geechee-Gullah ring shouts. Board members and volunteers remain actively involved in maintaining and improving the garden area. Recent plantings included bulbs that Louis LeConte had in his garden including Hippeastrum x johnsonii, Zephranthes atamasco, Zephranthes candida, Lillium superbum, Amaryllis belladonna, Crocus Sativus, Sternbergia and Sprekelia formosissima. A donor from the Atlanta area provided 100 Pseudonarcissus bulbs and 75 Spanish Spanish Bluebell bulbs. 90 roses and a variety of camellias were also planted. A new garden fence was installed to further enhance the area. Benches were installed in the garden area and shrubbery was planted by the garden gates. New bridges were built and old bridges repaired to facilitate hiking along the nature trail. Recent grants included a Garden Club of Georgia's Historic Preservation Grant and a Liberty County Historic Preservation ESPLOST Grant. A matching grant was provided by the Garden Club of Georgia for new signage. The Liberty County grant was used for bridge repair. The Oleander District of the Garden Club of Georgia also made a recent donation. A prevous grant from The Garden Club of Georgia Historic Landscape and Garden Grant Committee was used to expand the garden, repair the irrigation system, purchase additional Camellias for the camellia area and initiate improved weed control through professional herbicide spraying. Camellias were a significant part of LeConte-Woodmanston's history. Louis LeConte introduced the Camellia to Georgia. One of our dedicated board members succeeded in locating a variety of historical Camellias and headed up the effort to plant 906 historic bulbs in two 16 foot square beds. Some of the bulbs planted date from 1810-1813. Spartina Garden Club members also assisted in the bulb planting as did some of our wonderful volunteers and board members. If you would like to donate a Camellia or a plant please check our Camellia Wish List or Plant Wish List. Another board member has put much effort into doing historical research and was able to provide additional information concerning the LeConte family as well as the relationship between Joseph LeConte and John Muir. Check out our history section including a picture of Jane LeConte and a chapter from the book "Reminiscences of Famous Georgians" - John and Joseph LeConte: The Gemini of the Scientific Heavens. Plans for the future include continued expansion of Louis LeConte's world famous 19th century gardens by including more historic camellias, bulbs and pre-1840 variety roses and maintenance of garden, nature trail and swamp areas already established. Garden Clubs in the area are considering the possibility of adopting and maintaining some of our garden plots. SCAD students are also looking for ways to enhance the site with art forms and are also willing to do work concerning a "Praise House." The previous Children's Garden area will continue, for the present time, as a demonstration plot but may in the future transition into an area for native plants. One of our long range goals includes using the nursery to propagate historic Camellias. Are you considering volunteering at LeConte-Woodmanston? A variety of opportunities are available. For volunteer opportunities check the Get Involved page. If you are interested in participating please contact us. Are you considering foundation membership? If so please check our membership page.